Mixed vegetables cooked with crushed peanuts and peanut butter in coconut milk. Heat oil in a non-stick pan. Add garlic and ginger and sauté till golden. 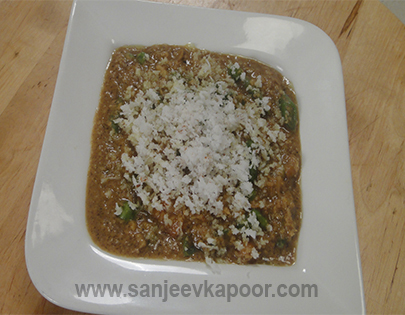 Add crushed peanuts, coconut and peanut butter, mix well and sauté on low heat for 2-3 minutes. Add coconut milk, 1½ cups water and stir to mix. Add curry powder, salt and pepper powder, stir to mix and simmer for 2-3 minutes. Add carrot, beans, green peas and cauliflower, mix well and bring to a boil. Serve hot garnished with coconut.